HP Velotechnik's Street Machine Gte improves an already gorgeous view from the top of Bear Mountain. 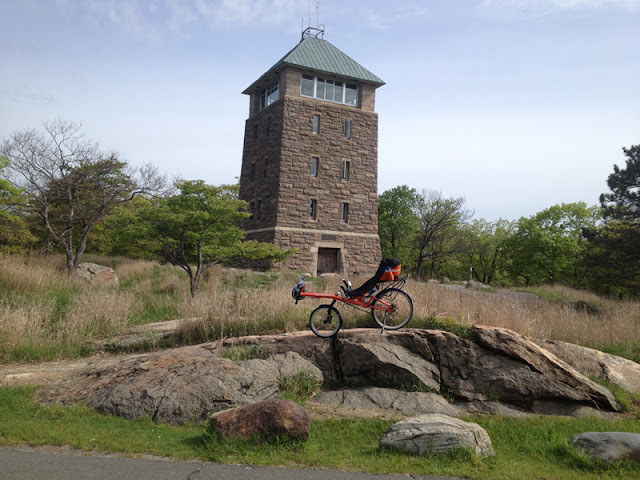 The other weekend I had a nice 2-day ride across Harriman State Park (New York). I had clear, dry, non-smoggy air, perfect temperatures, and, as always, a great view from the top of Bear Mountain. I packed light and slept at the Adirondack Mountain Club's camp. On Sunday, it rained. Those who enjoy riding recumbent bikes up hills would enjoy this trip. Bear Mtn. has an average grade of about 6% with a short section of around 10%. In the city, I get a lot of "cool bike!" comments when I ride an HP Velotechnik. 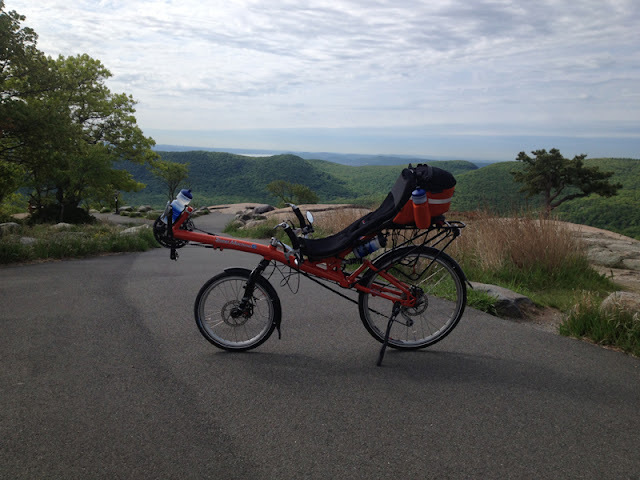 But on Bear Mountain, I got many a "good morning" and thumbs-up from the road cyclists who frequent Harriman's roads and who, maybe, up until that point thought that recumbents "can't do hills." A "cool bike" posing for a photo in front of the Bear Mountain lookout tower. Hi Robert, I'm loving your bike, I haven't seen one before! I'm looking for options because I want to begin a new sport...and mountain bike is the winner!! I'm buying my equipment, and I wanna to ask you if tha brand catlike is a good one for helmets... I found this one surfing in the internet: http://www.catlike.es/us/en/helmets/mountain-bike/leaf/. Any comment is welcome! Thank you!